Whether you’re looking to challenge yourself with a new skill or deepen your understanding of a particular topic, Sandhills Community College’s Center for Creative Living can help you reach your personal goals to achieve a more intellectually rewarding life. “Examining President Trump’s National Security and Foreign Policy” introduces the current administration’s national security and foreign policy aims. Topics include the 2017 national security strategy, diplomacy, the Koreas, the South Asia policy, Syria & Iraq, and counter-terrorism policy. Upon completion students will be able to describe and identify the basic concepts, along with any successes and drawbacks of the President’s approach to these topics. “Examining President Trump’s National Security and Foreign Policy” will be held on Wednesdays, Nov. 7-Dec. 12 from 10 a.m.-noon. The cost is $75. Prepare comfort desserts such as strudel and bread pudding in “Fall & Winter Comfort Desserts.” These are perfect for that sweet tooth on a cold day. “Fall & Winter Comfort Desserts” will be held on Monday, Nov. 5 from 10 a.m.-1 p.m. The cost is $75. In “Keto Cooking Series,” share fresh ideas for Keto-friendly meals including soup, entrees, vegetarian entrees and dessert. Join us for a little low-carb inspiration. 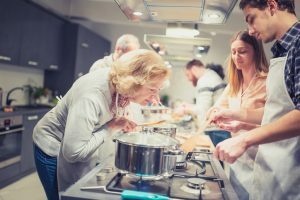 “Keto Cooking Series” will be held on Wednesday, Nov. 7 and Thursday, Nov. 8 from 5-8 p.m. A second class will be held on Tuesday, Nov. 13 and Wednesday, Nov. 14. The cost is $150. Join us for “Comfort Food Series” and enjoy a mixture of feel-good foods. In the first class, learn to prepare lasagna Bolognese where rich Ragu and silky béchamel come together to make this lasagna a favorite that only improves with time. In the second class, create a French Cuisine. Coq Au Vin oven-roasted root vegetables and chicken gently braised in wine. Yum! For the final class, Chef Angela takes you back to yummy mac and cheese, but grown-up style. This mac and cheese is a remix version to please the bigger kids in the family. Aged cheddar, Parmigiano and Fontina, along with some luxurious additions and a seasonal side salad, make this your new classic Mac & Cheese. “Comfort Food Series” will be held on Tuesday, Dec 4 and Wednesday, Dec. 5 from 9:30 a.m.-12:30 p.m. A second class will be held on Thursday, Dec. 6 and Monday, Dec. 10 from 5-8 p.m. The cost is $75. “Holiday Party Hors D’oeuvres” will be held on Tuesday, Dec. 11 from 5-8 p.m. A second class will be held on Wednesday, Dec. 12 from 9:30 a.m.-12:30 p.m. The cost is $75. 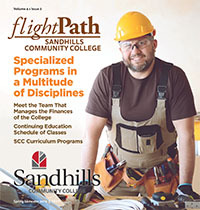 Register in the Sandhills Community College Continuing Education office located on the first floor of Van Dusen Hall on the Pinehurst campus at 3395 Airport Road. Registration by phone with a credit card can be made by calling (910) 695-3980. Registration hours are Monday through Thursday, 8 a.m. until 5 p.m. and Fridays from 8 a.m. until noon. You can pre-register online at www.sandhills.edu/cereg.